Physiotherapy can be very beneficial for people suffering from back pain. Our physiotherapists specialised in back pain rehabilitation offer tailor made back pain treatment according to your particular needs, performed at your home in London so you don’t have to deal with travel when in pain. However, if you prefer, you can also visit us at one of the two Light Centre practices in London, Light centre Moorgate between Liverpool Street and Monument station, Light centre Belgravia near Victoria station or in our physiotherapy practice in Clapham between Clapham south and Clapham common. Our physiotherapist specialised in back pain will assess your condition, to find out the cause of your back pain, and will create a personalised back pain rehabilitation exercise programme that suits your schedule and activities. This will include different back stretching and flexibility exercises, as this is the most effective way to treat back pain and speed up recovery. The physiotherapist will also show you some exercises to reduce your back pain that you can do on your own time between physiotherapy sessions and will also train you how to lift heavy objects safely, bend and sit properly, both at work and at home, in order to avoid any future back injuries and relapse. Why do we suffer from back pain ? Our spines are not designed for sitting down at a desk or in a car, or for enduring repetitive movements for several hours at a time. This is why most people will experience back pain at some point in their life. Depending on the cause, symptoms can develop straight away, or take weeks or even months to appear. The severity of symptoms also differs and can range from tenderness and stiffness to severe pain that hinders people carrying out every day activities. They may last a few hours or days, or become a chronic issue. In most cases back pain can be treated with painkillers and rest, but for severe cases of injury and chronic back pain, surgery might be needed. 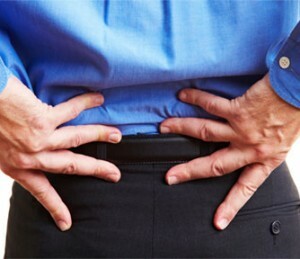 Affecting around 1 in 3 adults in the UK each year, Lower Back Pain (LBP) is a very common disorder, with an estimated 2.5 million people seeking help from their GP about their condition. What could be the origins of lower back pain ? Many more mechanical or non-mechanical issues can create pain in your back, to have more information; you can call or consult our expert physiotherapist and osteopath. To cure Lower back pain, we need to understand from which tissue your pain comes from and what the root causes of your condition are. Therefore, for us at London Home Visit Physiotherapy, clinical reasoning (using our brain to understand your problem) is an essential part of our management. Second, a specific examination will be performed to test these different theories. These examinations consist of a mixture of active movements (we ask you to move), passive movements (you relax and we move your joints), and other targeted tests. Third, In regard of this diagnosis, we will develop a tailored treatment plan. This approach allows us not only to be more efficient but also to have a treatment tailored for your specific condition and your specific needs.